Children from the Parramore community helped Central Florida leaders sink shovels into the dirt today at a groundbreaking ceremony ushering in a transformative campus that will soon rise in downtown Orlando. Dr. Phillips Academic Commons is the first building to be built at the new campus the University of Central Florida will share with Valencia College. The campus is expected to serve 7,700 students from both institutions when it opens in 2019. The groundbreaking was a chance for the community to celebrate the campus’ beginnings – and the changes it will bring not only to downtown Orlando but to future students’ success. Valencia College President Sandy Shugart said Valencia and UCF will work with the community to build a campus that positively impacts the future of its residents and neighbors. Dr. Phillips Academic Commons will be the center of campus, a dynamic building with classrooms, collaborative space and an open-air courtyard. The four-story building is designed to provide a full college experience from the first day it opens in Creative Village, a new high-tech neighborhood sprouting from the former site of the city’s old Orlando Magic arena. 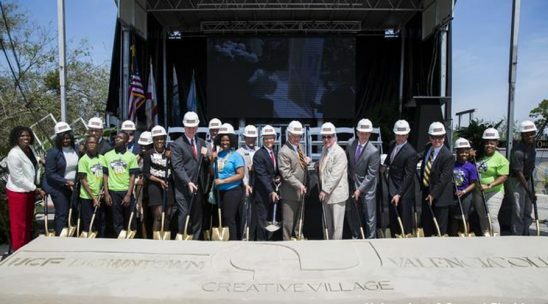 Orlando Mayor Buddy Dyer called the campus a “game-changer.” Thousands of college students will bring a vibrant, 24/7 energy to downtown, and the campus will kick-start further development in the Creative Village $1 billion private-public partnership. The presence of UCF, Valencia College and a new Preschool-8 school built by Orange County Public Schools will make it possible for children to progress from kindergarten to graduate school in the same community. And the downtown campus will be a source of job training, workshops and more for neighborhood residents. Porcha Jones, a junior at nearby Jones High School who lives in Parramore, plans to attend the downtown campus after she graduates from high school. The 17-year-old was presented with a $1,000 scholarship from UCF and Valencia at the groundbreaking event, which will help her achieve her goal of pursuing a career in sports medicine or becoming a doctor. Hotelier and philanthropist Harris Rosen’s foundation also will cover the cost of undergraduate degrees for Parramore students if they choose to attend Valencia and UCF, or any other university, state college or vocational school in the state. And successful high school students from Parramore who wish to become doctors and gain admission to the UCF College of Medicine will be able to attend on full scholarships. The construction of Dr. Phillips Academic Commons would not be possible without the help of its namesake, Dr. Phillips Charities. The nonprofit organization donated the lead gift – $7 million for the project to expand access to the transformational power of a college degree. The four-story building will feature 148,000 square feet of active learning space split between east and west wings along a realigned Livingston Street. The two wings will be connected by a glass bridge on the third and fourth floors. The bridge will hold a pedestrian walkway as well as space for student activities and offices. Viewed from the exterior, the bridge will create a dramatic portal for those entering the campus from the Creative Village. UCF’s Center for Emerging Media – housing the top-ranked Florida Interactive Entertainment Academy – already sits adjacent to the new building site, and will be renovated. UCF is constructing a 600-space parking garage for students, faculty, staff and visitors to the campus next to the Center for Emerging Media. UCF is building a tri-generation plant that will be the primary source for electricity, chilled water and hot water for the entire campus. KUD International and Ustler Development are constructing a 15-story building that will include Valencia’s Walt Disney World School of Hospitality and Culinary Arts, 600 beds of student housing, a parking garage, shared student space, offices and retail space. Construction will begin this summer on all projects, and the buildings are scheduled for completion by the start of the Fall 2019 semester.